Though it is common to find African Grey parrots for sale among other pet parrots, a prospective owner should know just how involved African Grey Parrot care is. Here are seven things about African Grey Parrot care that every owner should know. 1. Involvement— The main reason that many are drawn to the African Grey is their well earned reputation for being intelligent. Many studies have indicated that African Greys are as intelligent as a five year old human child and require everyday involvement of the whole family. 2. 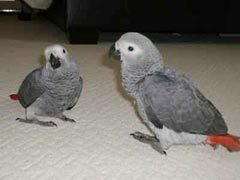 Talking — The unfortunate thing is that not every single African Grey will ever learn to talk at all! While some will learn how to string together sentences, others will only mimic household noises, and others will remain resolutely quiet. Buying an African Gray parrot only for its potential to speak may never yield results. 3. Diet — Like all parrot breeds, a diet of bird seed or pellets alone is actually harmful to them. For proper African Grey parrot care, their diet must be varied and full of fresh fruits and vegetables every day. 4. Space Requirement — African Greys require the largest amount of space available, so an owner with limited space should not consider them. The smallest space should be 3 feet by two feet by four feet tall, but the bigger the better! 5. Mental Stimulation — Considering their above average intelligence, African Grey parrots require a large amount of stimulation. Toys and lots of time to explore and learn are keys. 6. Feather Plucking — One of the more common problems in African Grey Parrot care is a tendency to pluck their own feathers. They become moody or depressed when bored, and will resort to biting or feather plucking. They also react this way if ill, so any parrot showing signs of feather plucking should be taken to the vet. 7. Time — As mentioned previously, African Greys can be as intelligent as a five year old human child. Emotionally however, they average age two. That being said, they need a toddler’s worth of attention and dedication. They thrive on joining in on every activity, and become distressed when left alone. Also, be ready to commit many years to owning an African Grey parrot: their life span can reach as long as fifty years! While African Grey parrot breeders can answer other questions, it should be clear the African Grey parrot is certainly not a starter bird for an inexperienced owner. However, for an owner ready for the commitment, they can be a source of joy and love for many years.